A few hours later, I could be found doing ten things at once. That's pretty typical of me, but this time, I was actually trying to make a break for the door. I had a meeting with three very cool authors at Another Bookstore, and I didn't want to be late like the White Rabbit. Proving yet again that I'm Alice, I was early. An hour early. I amused myself by cleaning up displays and shelving books in the proper spot. I have felt the compulsion to do this in stores since I was, oh, I don't know, BORN. I always reshelve books in libraries and bookstores, whether or not I actually work there. While I was idly facing out all of my favorite books in the teen fiction section, in walked those I awaited: Sarah Mlynowski, E. Lockhart, and Lauren Myracle. Each of these authors has an impressive backlist, having written titles written for different ages, from tots to adults. 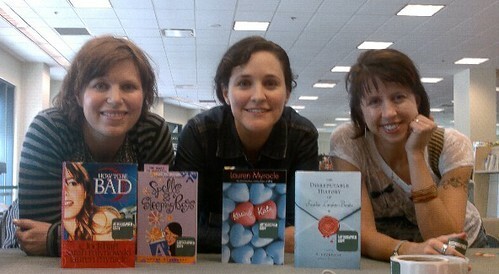 The trio collaborated on a YA novel, then let fans vote online for one of three possible titles. The winner, HOW TO BE BAD, can now be seen in all of its shiny glory on the front of the newly released hardcover. I had many questions for the trio, and they had plenty for me. This was the first time I'd met any of them in person, and I was flattered that they wanted to chat with me. Here are three questions we thought readers would like answered. What books did you like as a teen? Lauren Myracle: Books by Judy Blume, Lois Duncan (favorite: Down a Dark Hall), Norma Fox Mazer (especially Silver), and Cynthia Voight (especially Izzy, Willy-Nilly). Sarah Mlynowski: Books by Christopher Pike, like Spellbound and Sati, and Judy Blume. I still recommend Judy Blume. E. Lockhart: Douglas Adams. Agatha Christie. S.E. Hinton. Tom Robbins. What contemporary releases do you recommend? E.: Gingerbread by Rachel Cohn. An Abundance of Katherines by John Green. Suite Scarlett by Maureen Johnson. Sarah: Cures for Heartbreak by Margo Rabb and Before I Die by Jenny Downham (I love tearjerkers!) and anything by Ms. E and Ms. Lauren. Lauren: Heaven Is a Lot Like the Mall by Wendy Mass, Lessons from a Dead Girl by Jo Knowles, Such a Pretty Girl by Laura Weiss, and Wildwood Dancing by Juliet Marillier. When considering strength of character, which fictional females and books come to mind? E.: Valiant by Holly Black. The Murder of Bindy Mackenzie by Jaclyn Moriarty. Sarah: Robert Munsch's The Paper Bag Princess. How I loved that book. How I loved dressing up as Princess Elizabeth for Halloween. Lauren: Ramona Quimby! Go, Ramona! And Sarah, I don't want to hear a PEEP from you in protest, so just hush. Thanks to the generosity of these ladies, we have four, count 'em, four books to give away - all autographed by the authors themselves! If you would like to be the proud owner of these books, please attend the readergirlz Summer Sizzle party at the readergirlz forum tonight, Friday, June 27th! The chat begins at 6 PM PST / 9 PM EST. We'll have lots of authors in attendance, including the How to Be Bad ladies and the readergirlz divas. The aforementioned four books will be given as a set to one lucky winner. We'll be giving away tons of other books as well. All you have to do is show up and participate in the chat. Winners will be selected at random. Enjoy the party! The Spiderwick Chronicles are fantastic! I recommend reading Holly Black's other novels in order - Tithe, Valiant, and Ironside - and checking out Tony DiTerlizzi's beautiful artwork and illustrations in various picture books and the Spiderwick companion books. If you're in a Spiderwick-y mood, have you read the OutCast series by Christopher Golden and Thomas E. Sniegoski yet? Start with The Un-Magician. It's a quartet. I will try to figure out how to get into chat. I can finally go to one of these because I got off work early today - yay!!! Also, I totally reshelve books in bookstores and libraries too; I also feel very compelled to do it, esp. now because I kind of hope that someone working there will come by and be like "What are you doing?" and then when I explain myself, they offer me a job on the spot. I know, TOTAL wishful thinking, but whatever. One time, they had a Meg Cabot adult book in with her teen stuff, and I picked it up and took all the way across the store (literally from one corner to another, and it was a Borders so it was big) to put it back in its rightful place. But then I think the shelf that Cabot was on was packed so I had to just kinda shove it up on top of the other Cabot books, haha. And I missed the chat, though I did write a long post on the Summer Sizzle thread once I realized I had missed it, lol. I like order. I've always cleaned up messy displays in stores and put things back where they belonged. Sorry that you missed the chat! Loved this interview! Love the writers! Love the book!